Palomino RV weighs units at the factory, but does not weigh each truck camper as it leaves the production line. That said, they do have scales at the factory and a team pulls and weighs units on a semi-regular basis. As a magazine, we encourage Palomino RV to weigh and mark every camper with its exact weight and center of gravity. Palomino reports the dry weight of the 2016 Palomino SS-550 at 1,580 pounds. This represents a base camper without options. If you want a Palomino SS-550 at this dry weight, you may need to special order the unit from a Palomino dealer. The floor length of the Palomino SS-550 is 6’9″. The 6’9” floor length of the SS-550 is shortest pop-up floor length Palomino offers. Only the east-west Palomino SS-800 has the same floor length and a slightly lower weight. The short floor length and lower weight formula is what makes the SS-550 and SS-800 potentially well suited for short bed half-ton trucks. The width of the SS-550 is 7’2”. The 7’2” width of the SS-550 is the same as Palomino’s larger pop-up floor plans helping it look and feel like a full-size truck camper inside. 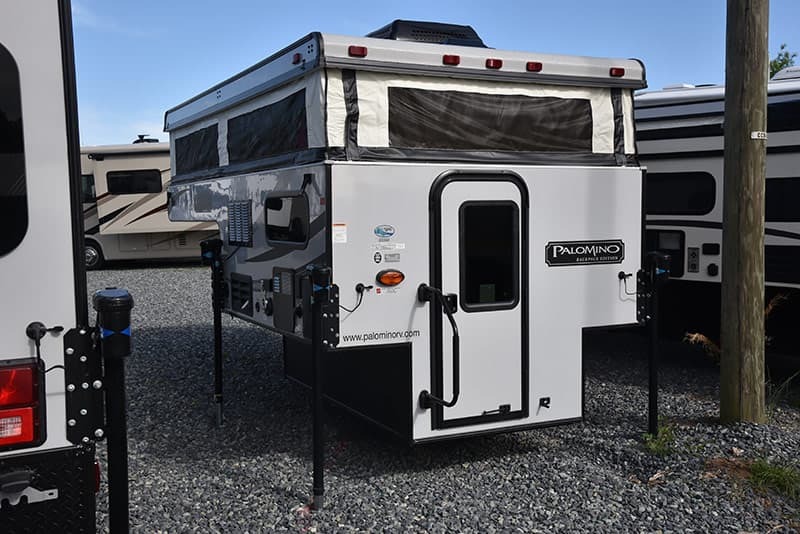 At 6’9”, the SS-550 interior height with the pop-up in the raised position is also the same as Palomino’s larger pop-up campers, and full-size. The low weight of the unit, shorter floor length, and extended north-south cabover puts the center of gravity at 22-inches. This is a dream for matching the SS-550 to a truck and, if properly payload matched, having the resulting rig handle well. The Palomino SS-550 has a 16 gallon fresh tank and a 6-gallon water heater. Since the camper does not have a toilet, shower, or bathroom, the only draw on this fresh water supply will be the kitchen sink, and the exterior shower. 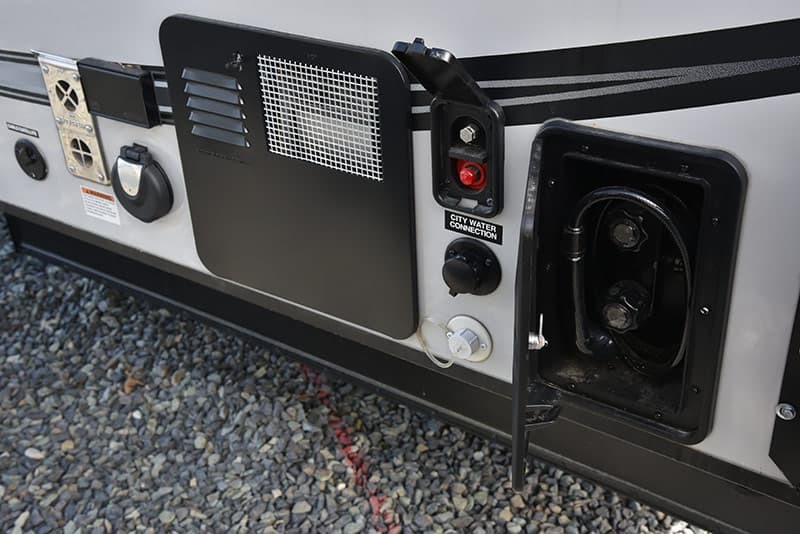 The exterior amenities are mainly on the driver’s side; water heater, power port, cable television connection, 110-volt outlet, city water, and exterior shower. From that perspective, 16 gallons of fresh water with a 6-gallon water heater is more than enough fresh water unless you take extended outside showers, or have some other need for fresh water (watering horses, washing surf boards, etc.). Someone who wanted to travel and camp off-the-grid for extended periods of time might also appreciate this ample water supply. The cabinet under the dinette seating may fit a small porta-potti. The SS-550 does not have a toilet so there’s no black tank. If you’re considering this camper, you will either need to bring a porta-potti, use campground toilets, or water the trees. 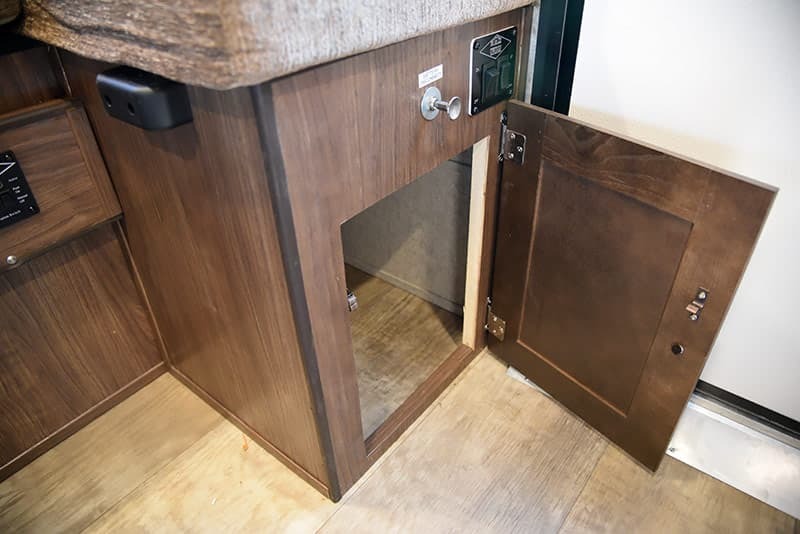 The under dinette storage cabinets are designed to fit a porta-potti. I would try fitting your preferred porta-potti model in this location before purchasing the unit. 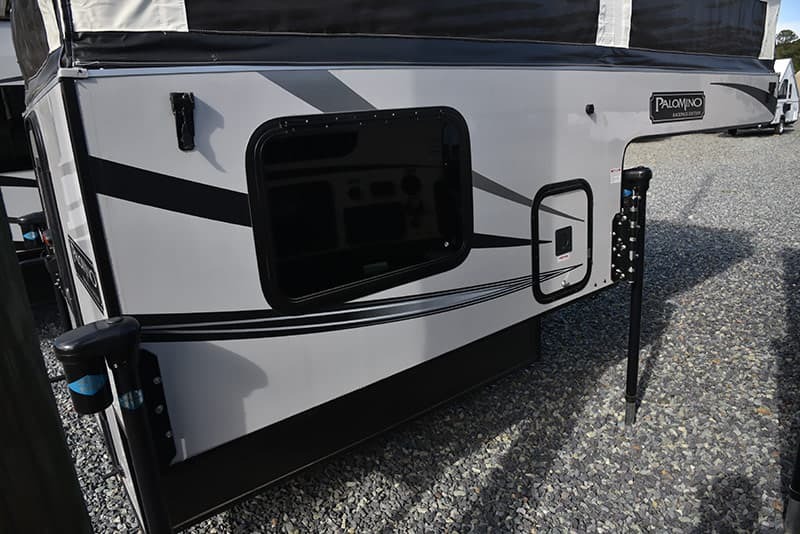 It should be no surprise that a short bed pop-up truck camper targeting half-ton trucks has provisions for a single battery and a single vertical 20-pound propane tank. When you’re designing a camper to a low weight target, adding another 50-plus pound battery and a 37 pound propane tank (tank weight plus 20 pounds of propane) is not on the menu. With all-LED lighting, the single battery (located under the front cabover step in a sealed box) is certainly sufficient for the SS-550. The only caveat would be if you regularly camp in cold weather and need to run the furnace over night, or have other power requirements (inverter use for coffee makers, hair dryers, etc.). 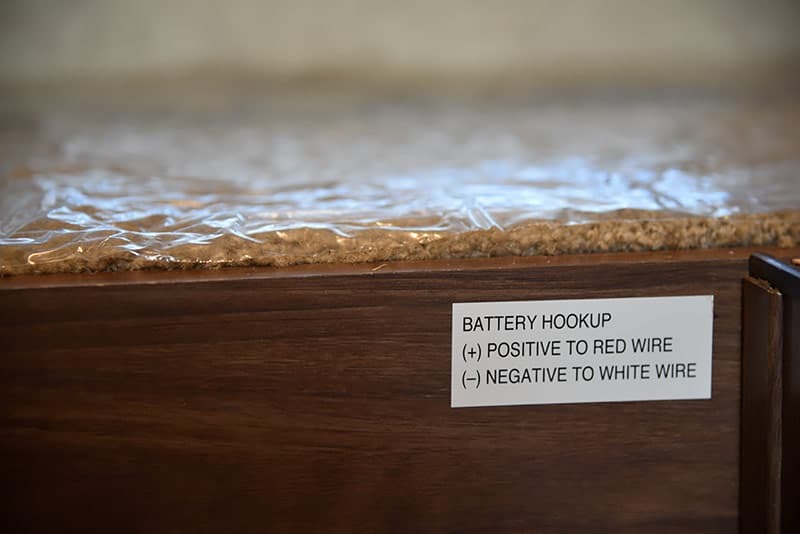 In that case, you may want to consider a 100-watt solar panel (or more), and/or a second battery with a Torklift International Hidden Power under your truck, and/or a portable generator. No matter what, I’d recommend adding the 100-watt solar panel. The single 20-pound vertical propane tank is excellent for exchanging at any number of box stores, gas stations, and grocery stores coast-to-coast. 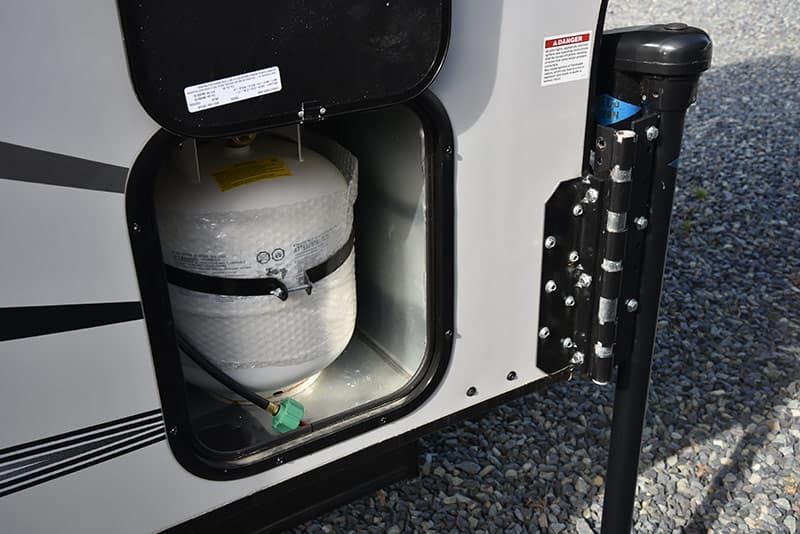 This single tank feeds the propane heater, refrigerator, cook top, and water heater. It presents the chance to unexpectedly run out of propane in the middle of a camping trip. To avoid this, pay attention to your propane level, and fill or exchange the single tank before it runs dry.